Continuing my recent and ongoing theme of Party and light game up reviews, I couldn’t pass up the chance to add my two cents to one of the newest additions to my collection: Joking Hazard. Now, you’re probably familiar with at least one popular game in the same vein: Apples to Apples, Cards Against Humanity, the T-Shirt Game, Say Anything, or practically any other game where a subject is given and one player (the judge) chooses an option, provided by other players, as the winner… And for good reason, these games can be great fun for 3+ players with very little down-time and a practically nonexistant learning curve. Everyone wins! 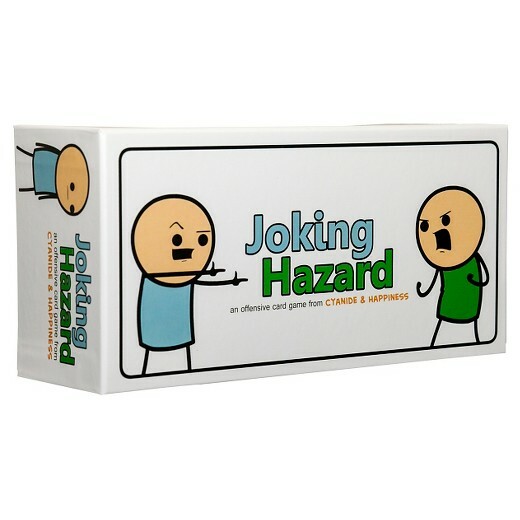 Of course, add to that already fun gameplay, the sarcastic and off the wall humor of an established web-comic like “Cyanide & Happiness“, and you have an amazingly funny and varied game, called Joking Hazard. What makes this game different from many already on the market is that, unlike Apples to Apples or CAH, which have subject and answer (green & red or black & white) cards, Joking Hazards’s cards are all panels of a comic that can be played in any order… let me explain.